If you love shallow movies.There isn't any depth in this movie. The jokes, story, villains, subplots. It all falls flat. It all one-dimensional. We have a mysterious-looking antagonist named Ghost, but she can't be mysterious, and at one point she serves up a clot of over complicated exposition that gives the film little bit action. You don't care if she'll accomplish her goal or not. You don't even care which side is going to win. We have lots of jokes, but they're all stale. If you guys find this humour funny, I'm sorry, I just can't take the movie seriously. While some ''intense'' interrogation scene was going on someone's cell is ringing with a joke sound. And this call is in this movie just because to be there - just because to be ''funny''. It doesn't have any contribution to the story. We have a story that concerns a rescue mission. But there isn't any complexity or twist that blows the audience away. Just flat. You could easily predict what's going to happen next. We have a subplot concerning a romantic relationship between Antman and the Wasp. But there isn't much, it just teases us around. And that's all. We have another subplot concerning a lovely relationship between a dad and a 10 years old girl, which is not very well developed but a little bit heartwarming because it's a relationship between a dad and a 10 years old girl.While a woman who is in constant physical and emotional pain is trying not to die, the movie is trying to be funny. Peyton Reed maybe should've gone for the head, not chest. But then again, he can't, Disney has the strings. It got to try to be colorful, amiable, ''funny'' with forced jokes. I really wonder when Marvel and Disney are going to take some risks and make a groundbreaking superhero movie. I guess never. Critics and audience fine with eating this.There isn't any climax, or depth, or emotion. Just a filler movie with no heart and soul. Unlike in most of the franchises where the third installment is the weakest, MCU happens to be consistent in making the second installment the weakest one, except for "Captain America: The Winter Soldier" (2014). "Ant-Man and The Wasp" is a continuation in the legacy. It was mostly vague, and almost a total crap. It doesn't try to be anything more than a filler. To be honest, it felt like a dumbed down version of "25th Hour" with a lighter tone featuring some superhero characters. It simply aims at being a movie with some little fun stuff but being disposable on the whole. Both of the major plotlines - one involving Ghost and the other involving Sonny Burch felt just like something that was there to help the plot go further. The characterization of Ghost and Burch have no depth in them. Burch is totally shallow and one dimensional and generic. Ghost has a little backstory, and isn't enough to get behind the character. The motives which drive both the plotlines are totally clichéd and thinly built. It felt as if they thought 'Ghost isn't a good villain, let's distract the viewers by giving them the other plotline'. This created an "Iron Man 2" level of multiple plotline mess - a little less interesting. Ant-Man is a sidekick in this movie. From someone who could bring about a well planned heist to a doofus - with no explanation. Giant Man plays into the story, but it's more for slapsticky purposes. Also, the original Wasp gets some powers in the Quantum Realm which are not even explained by this movie. Surely, it might be explained in future films, but it could've easily done that. Lawrence Fishburne feels like a wasted talent in this movie. It seemed like a promising character, but turned out to be the same old "good guy in the bad guy's side" character. One good thing about this movie, besides the cast, is the deaging CGI. It looked awesome. To me, it felt like Michael Douglas from the 90s with just a different hair and almost similarly with others. Father-daughter dynamic between Scott and his daughter was likeable. To sum it up, I must say that it was way below my expectations. It's not that I have watched an impactful and emotionally craving "Avengers: Infinity War" and I wasn't in a mood to watch something so less impactful. I knew it wasn't going to be a spectacular as IW but neither did I expect it to be so much of a mediocrity. It's not that the aftermath of IW has holded this movie down. After a long time, it will develop the same legacy as that of "Iron Man 2", at best. I wonder how the same critics who panned "Justice League" (2017) for having a thin plot and creating a mess gave it a thumbs up. As someone who likes "Ant-Man" (2015) and considers it to be the most underappreciated MCU movie till date, its sequel was mediocre at best. I thought "Black Panther" was going to be the worst MCU movie of 2018, but I was wrong. It's "Ant-Man and The Wasp". It gets a "D+" and a "4.1/10". Even though I enjoyed the first one as a comedy movie itself (and not a hero movie, more like an "introduction" movie into becoming some sort of hero), it was "ok" for me the fact that they inserted a very generic, uninteresting, forgettable villain in it (by now we always expect this kind of villain in MCU introduction movies).Well, this time they expanded the team into Ant-man + Wasp, which was nice. But that was the only main change (besides the after-credit scene). They still managed to create the same structure of the previous movie, instead of a "hero movie"...again a comedy movie... instead of a well developed villain, again the same uninteresting and forgettable villain.Personally I think I lost money watching it since it was again more of the same, maybe I have should waited until it was on Netflix or something. I saw a lot of people hating this movie, because he didn't have a connection with Infinity War or Avengers 4. I thought the movie was truly amazing, it's funny, but can be emotional at the same time. Well, of course it will not have awnsers to Infinity War events, because it his BEFORE Infinity War. Why can't people just understand that? If you haven't seen it yet, I recommend it very much. For me, it was even better than the first one. I watched this with out watching the original or reading the comics, so I didn't that much about the back story or characters. It didn't really matter all that much though, because it doesn't rely to heavily on other stories. The plot isn't overly complicated, and doesn't try to be some 'it's going to be the end of the world if you don't do this in a certain amount of time' movie. At its core, it is about finding and re-connecting with the loves ones you haven't been with in a long, long time. It's sweet, and funny, and a toned down family film. The action scenes are pretty exiting, with things growing and shrinking, and other things disappearing and appearing. It does pale in comparison to other better, more sophisticated marvel movies, due to its familiarity and no long term lasting impact. It's joyful in a special way. I recommend it.How could anybody rate this movie 1-star, 2-stars? Just an overal good movie. The story could have been a bit better and the villans were not Thanos-level but it just does the job. I wanted more actually, because the CGI was really good. Also this is one of the funniest mcu movies, so if you want a good laugh I recommend this. I applaud Paul Rudd and Micheal Douglas, great performance! If you're a marvel fan this will satisfy you 100% and even if you just want to relax and enjoy this movie with the family, that's cool too. It's kind off not really tied to the rest of the mcu, just as the first one, only captain America civil war a bit. Make sure u stay for the first post credit scene! 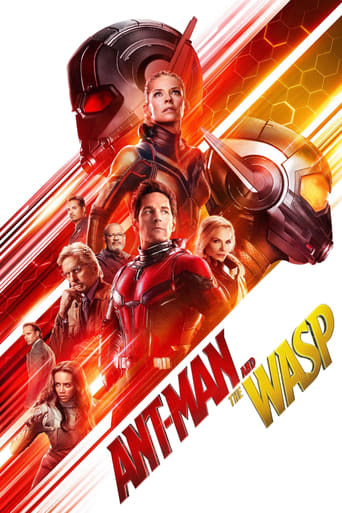 Downloading Seeding Ant-Man And The Wasp (2018) [BluRay] [1080p] [YTS.AM] from to 0 peers.